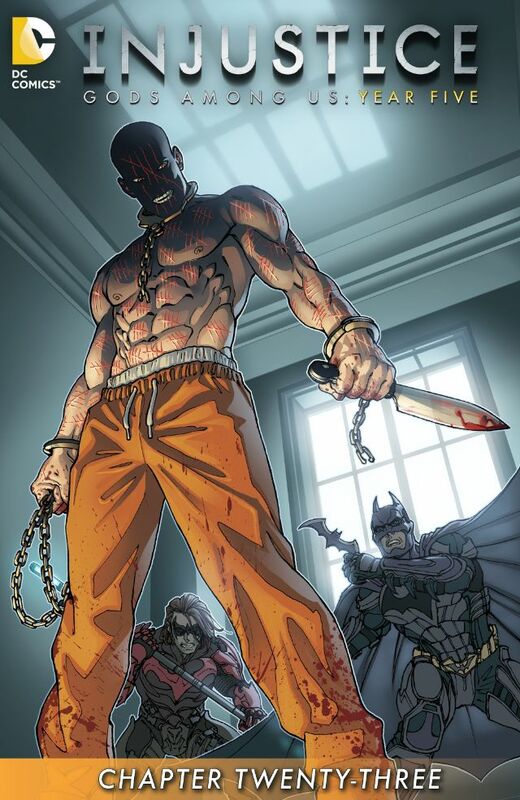 Alfred investigates an alarm in the Batcave, and discovers Victor Zsasz. Zsasz wants the location of the Batman, but Alfred refuses to divulge Batman's whereabouts. A fight ensues, and Alfred fares poorly. Damian Wayne arrives later and finds Alfred's prone, bleeding body. Story - 2: You know it's bad when you're apathetic to the death of a major character within the story. Worse when you're actually pleased that the character is gone. Alfred has gone from being the friend, confidant, and surrogate father of The Batman, to a self-righteous hypocrite. There was a time when Alfred would have provided sound counsel to Batman or anyone else involved in a mess like this. Instead, he's been used, much as Commissioner Gordon was, as an ineffective counter to rise of Regime Superman, as he gives nothing but platitudes and the obligatory "badass" moments. Sure, he knocked out Regime Superman to save Bruce Wayne's life, but he never pressed Bruce Wayne his decision making or choices. A discussion with Bruce on why he's willing to work with criminals and murderers in order to stop Regime, or on the insurmountable nature of his battle against the Justice League never happened. There was never any wisdom from Alfred, and his death, unlike Commissioner Gordon's, serves no purpose other than to solidify the hold Regime has on Damian, and because he has to die anyway - it's in the video game. Regime Superman is a husk of what potential he had as a villain earlier, as it's alluded to that he sets Zsasz on this path, and merely because of the insult that Alfred offered him earlier. Harley Quinn, who took part in the deaths of Jimmy Olsen and Lois Lane is not only free, Regime has never targeted her once, saving the brunt of his animosity for Batman - it's in the video game. Quinn's self-serving psychoanalysis was a low point for the series, as she absolves herself of responsibilities, much as the readership does, but Alfred drives it farther downward. Alfred's murder is lacking in any poignancy that it should have, empty of purpose other than being the next dot to connect, and worst of all, occurs in the penultimate issue of the series, the next being the final. Buccellato has proven to be a poor successor to Tom Taylor, whom I took great issue with as well, but Taylor had a handle on character and story, which while disagreeable, was at the very least, competent. Buccellato has rendered onto the readers a vacuous story that seems to be turned in only for the purpose of steady work and the rewards aligned to such. If you've read the series from start to this point, one has to wonder if what has occurred is pleasing enough to readers to be satisfied after a five year patronage to a story and series that reminds us with every turn of the page, that it just doesn't deserve it. Art - 2: Much like Buccellato's lacking tale, the art that visualizes it is equally rote and empty. No storytelling to be had here.